May 25, 2017 - KMTV Omaha - "In the Classroom, Getting to know the Missouri River"
May 22, 2017 - WOWT Omaha - "Volunteers Remove More than 11 Tons of Trash from Missouri River"
May 20, 2017 - WOWT Omaha - "Bold Souls Pry Mysteries from Cold, Wet Big Muddy Teeth"
Our education and outreach programs expanded with two workshops for educators and an enlarged enrollment at MRR’s River Academy—the residential summer camp for teen-aged students. The second Missouri River Rendezvous moved to Saint Joseph in November where MRR bestowed the “River Hero” Award to MR-340 Race Director Scott Mansker. MRR also is wrapping up the River Stewardship grant program to eight river-related organizations. These projects were financed mostly by an EPA Environmental Education grant that closes out this year. HUGE gratitude to EPA and to Jan Weaver from the Missouri Environmental Education Association (MEEA), who wrote the grant proposal. 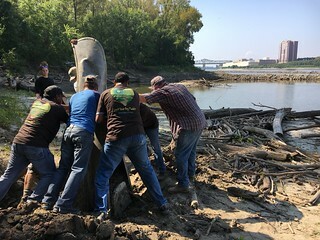 These mileposts were built upon the groundwork of river clean-ups this year from Omaha-Council Bluffs to Saint Charles, including big events in Washington, MO, and Boonville along with MRR teams helping with clean-ups in Kansas City and the Meramec and Mississippi rivers. Teamwork makes it happen at the 2017 St. Charles Missouri River Clean-up. 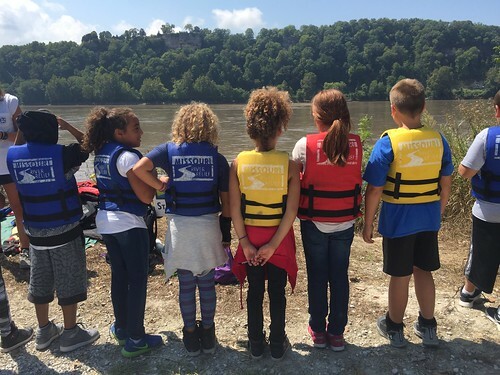 MRR expanded educational boat trips tremendously, including a year-long program with Columbia Public Schools to introduce every Fourth Grade Student to the Missouri River. 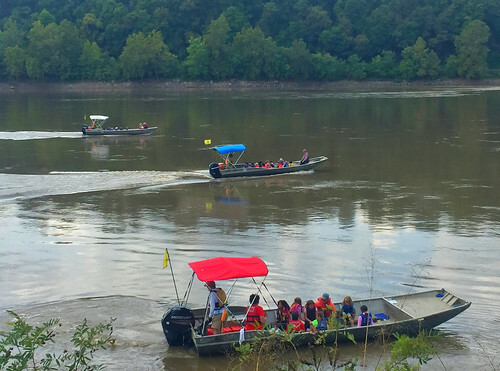 MRR also operated free boat rides during the annual Eco-Art Festival at Cooper’s Landing and a support boat for the 100-mile Paddle MO trip organized by Stream Teams United. Unparalleled river experience at "Missouri River Days". photo by Kristen Schulte. MRR boats and crews continued to run support for four paddling races—the “Spring 12” by Osage Paddle Sports, the “Race for the Rivers” by Greenway Network, the “Missouri American Water MR-340” by RiverMiles and the “Race to the Dome” by Missouri River Relief. In addition, MRR continues to co-sponsor the monthly Big Muddy Speaker Series, to host the annual Wild & Scenic Film Festival, and conduct outreach by setting up booths for a handful of community events. MRR stands out as a grassroots, equipment-based, action-oriented group. A compelling part of our story is the volunteer community called the Missouri River Relief Crew - a tight group of dedicated river lovers who travel up-and-down the river; who pitch camp and cook meals; who plan events around a campfire and who celebrate success around the same ring of fire. They are at the heart of everything we accomplish. Everyone who comes to an MRR on-the-river event becomes part of a trash cleaning team; shares an adventure on the river, and returns with stories to tell and memories to treasure. We invite you to join this community of people taking action on the river— there are many ways to help and everyone has something to contribute. Please accept our heart-felt gratitude for your continued support—THANKS!!! Ready for the River at "Missouri River Days". photo by Kristen Schulte.